Description : This well-designed leather travel wallet has a triangular leather colour combination taking into account the needs of the traveller. The back of the wallet has two slots to accommodate boarding passes. 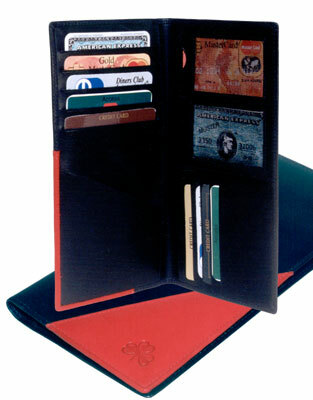 On opening, the LHS has a slot for the passport and five credit card slots. There are two deep pockets on each side. The RHS has one more pocket for any important travel papers. There are two small mesh pockets and 4 credit card slots. The model can be made in different types of leathers like Cow Polished, Cow Nappa, Cow Vegetable, Buff Resin, Buff Glazed, Buff Vegetable and Cow Softy. The colours available are black, blue, brown and shades of cognac and burgundy.